Purchasing Puppets can be very expensive! for under $10 in materials! I purchased a professional puppet for $80 many years ago and only used it a few times as the mouth was so stiff that it wore out my hand in one song. I purposed then to design a pattern that would allow for best hand movement as well as be able to produce inexpensive puppets. Twenty plus years later, I have sold puppets in several countries. 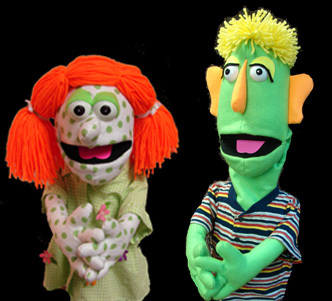 My family is involved in Children's Ministries and all the puppets we use are those that I've made over the years. This pattern is very versatile as you can see from the photos above. I even made a 5 foot ostrich from this same pattern with some modifications. so that everyone can afford it. So click on the PICS below to order your pattern that you can use over and over again to make literally hundreds of puppets. Start your own business if you like. Then visit Hobby Lobby or your favorite crafts store to purchase your material. You CAN MAKE your own puppet for UNDER $10 in materials. The PUPPET PATTERN DOWNLOAD includes a PDF that we will email to you. You can print out this pattern on regular 8.5 x 11" paper or card stock. The download has a link to YOUTUBE where you can view all the online video tutorials to walk you through each step of puppet making. Click on the PIC below to place your order today! Please allow up to 24 hours to receive your PDF pattern via email for the download option.